Cheng, D.; Claessens, M.; Gascoigne, N.R.J. ; Metcalfe, J.; Schiele, B.; Shi, S. (Eds.). 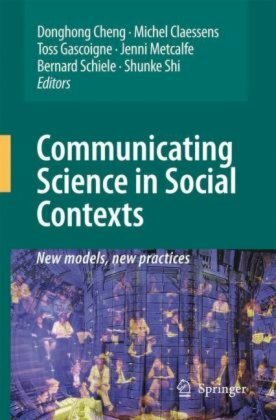 Communicating Science in Social Contexts. New models, new practices. Springer, 2008. This valuable tool is recommended for those interested in teaching people how to cope in a society dominated by science and technology, particularly researchers, science journalists, science museum and science centers staff, academic researchers who study aspects of PCST, scientists who interact closely with the public, press and public information officers of scientic institutions, science theater directors, and anyone interested in issues related to science communication. Part 1: Revisiting models.- 1. Paradigm change for science communication: commercial science needs a critical public.- 2. European trends in science communication.- 3. Words and figures of the public: the misunderstanding in scientific communication.- 4. Representation and deliberation: new perspectives on communication among actors in science and technology innovation.- 5. Medialisation of science as a prerequisite of its legitimisation and political relevance.- 6. On and about the deficit model in an age of free flow.- 7. Towards an analytical framework of science communication models.- Part 2: Crossing broundaries.- 8. Before and after science: science and technology in pop music, 1970 – 1990.- 9. The more, the earlier, the better: science communication supports science education.- 10. Hollywood knowledge: communication between scientific and entertainment cultures.- 11. Situating science in the social context by cross-sectoral collaboration.- Part 3: Developing strategies.- 12. From science communication to knowledge brokering: the shift from ‘science push’ to ‘policy pull’.- 13. Science advocacy: challenging task, difficult pathways.- 14. The epistemic jumble of sustainable development.- 15. In search of dialogue: staging science communication in consensus conferences.- 16. So where’s the theory? On the relationship between science communication practice and research.- 17. From democratization of knowledge to bridge building between science, technology and society.- 18. Bringing science to the public.- Appendix.- Index.